White paper on crime 2004 Part1/Chapter1/Section8/2. Fig. 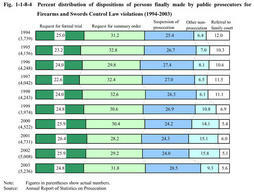 1-1-8-4 shows the percent distribution of dispositions for Firearms and Swords Control Law violations made by public prosecutors over the last10years. Fig. 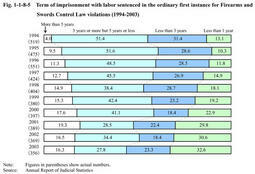 1-1-8-5 shows the term of imprisonment with labor sentenced in the ordinary first instance for Firearms and Swords Control Law violations over the last10years.As partial amendments were made to the Firearms and Swords Control Law in1993and1995to tighten regulations on offenses involving handguns,etc. (handguns,rifles,machine guns,and cannons;hereinafter the same)and to substantially increase statutory penalties for such offenses,about half of the convicts have been sentenced to imprisonment with labor for three years or more since1994and those sentenced more than five years has exceeded15%in recent years. When examined are the term of imprisonment sentenced in the ordinary first instance in2003for violations of the Firearms and Swords Control Law and the Ordnance Manufacturing Law(Law No.145of1953)with regard to handguns,live ammunition for handguns,and handgun parts,a total of100persons were sentenced to imprisonment with labor(including25persons suspended).Three were sentenced to10years or more,three persons to seven years or more but less than10years,15persons to five years or more but less than seven years,46persons to three years or more but less than five years,32persons to one year or more but less than three years,and one person to less than one year.By type of incident,56persons were convicted for"possession of handguns and live ammunition"(including54persons convicted for aggravated possession )and19persons for"simple possession of handguns"(Source:Data by Criminal Affairs Bureau,Ministry of Justice ). In2003,13persons'punishments were reduced due to submitting handguns and surrendering themselves voluntarily to the police.All of them were related to organized crime groups(regular or quasi-members of a group which might commit illegal violent acts habitually or as a group;hereinafter the same in this sub-section).In2003,54persons were granted suspension of prosecution due to submitting handguns and surrendering themselves to the police;among them,30persons were organized crime group members and24persons were other than them(Source:Data by Criminal Affairs Bureau,Ministry of Justice). A person who carries,transfers,or stores handguns,etc.with applicable live ammunition,etc.shall be punished for aggravated possession with a heavier punishment than simple possession.